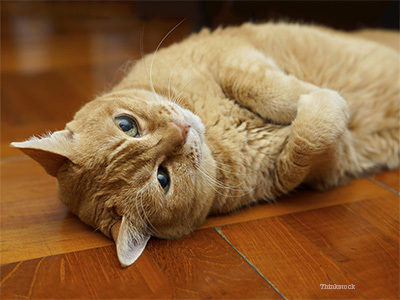 Hyperthyroidism is the most common hormonal disorder diagnosed in cats. It occurs when the thyroid glands, located in your cat’s neck, produce an excess of thyroid hormone. Thyroid hormone helps regulate and control normal bodily processes. Think of it as an engine gauge: in simple terms, it controls how fast or slow the body functions. When a cat’s thyroid gland becomes overactive and produces too much thyroid hormone, the engine gauge is turned up too high, leading to an increase in the body’s metabolism. While this may sound like a great way to shed a few extra pounds, the impact of hyperthyroidism on our cat friends can be dangerous. Over a long period, the overproduction of thyroid hormone can have a negative impact on the heart, kidneys, and other organs. The exact cause of hyperthyroidism is not known. This disease typically affects cats aged 7 years or older, and both male and female cats can become hyperthyroid. What should you keep an eye out for if you suspect your pet is hyperthyroid? The most common symptoms are weight loss despite a desire to eat more than normal, and restlessness. Additionally, some cats may look unkempt, vomit, drink more, urinate more, become cranky, and breathe more rapidly. In some cases, you can even feel the thyroid glands on your cat's neck because they sometimes become enlarged. This is called a goiter. So what do you do if you suspect your cat is hyperthyroid? Contact your veterinarian. She/he can run some simple tests to determine if your cat has this disorder. Additional tests may be added on an individual basis. Your veterinarian will recommend the right course for your feline friend. If your cat is diagnosed with hyperthyroidism, your veterinarian will discuss which treatment options are best for him and for you. Oral or topical medication: the generic name for this medication is methimazole and it will help reduce the production of your cat’s thyroid hormone, essentially helping your cat’s engine gauge return to normal. This medication doesn’t reduce the size of your cat’s thyroid glands; it disrupts the production of the hormone itself. This medication will have to be given for the rest of your pet’s life and is often administered twice a day. If you and your veterinarian decide that medication is the right option for your pet, regularly scheduled follow-up recheck examinations and laboratory tests are needed to ensure that your cat is on the correct amount of medication and there are no adverse side effects. Radioactive iodine therapy: this is considered a safe and very effective treatment for cats, offering a permanent cure. The treatment can be expensive because your pet will require special care while being treated, but once the treatment is done, your cat will not require medication or further treatment. Your veterinarian will discuss with you whether or not your cat is a good candidate for this treatment. This is generally considered the treatment of choice unless contraindicated by other problems your cat has. Therapeutic Diet: A prescription restricted iodine diet is another option that can be discussed with your veterinarian. If used, it must be fed exclusively. Surgery: your veterinarian may recommend the removal of the growth(s) on the thyroid gland. He/she will discuss with you whether or not your pet is a good candidate for this treatment. If your cat was diagnosed with hyperthyroidism, there is no one to blame! Watch this video to learn more about hyperthyroidism. Remember: even experts are unsure why some cats become hyperthyroid. Having a thyroid level included in your cat’s annual labwork from the age of 7 onward will help diagnose this disease in the early stages. Diagnosing and treating your cat effectively will allow your dear friend to live a long and healthy life!